What Is DA Form 285? DA Form 285, Technical Report of U.S. Army Ground Accident is a form used by supervisors to report any accident that happened on U.S. Army grounds and resulted in a serious injury, death or damage to property and equipment. The DA 285 is submitted for all Army aircraft accidents, non-Army motor vehicle accidents, and Army fires. The latest edition of the report - sometimes confused with the DD Form 285, Appointment of Military Postal Clerk, Unit Mail Clerk or Mail Orderly - was released by the Department of the Army (DA) in February 2009. An up-to-date DA Form 285 fillable version is available for digital filing and download below or can be found through the Army Publishing Directorate website. How To Fill Out Da Form 285? 25c. If treatment was given away from worksite, where was it given? unable to perform regular duties; job transfer/light duty/profile. 40.DID ALCOHOL USE BY THIS INDIVIDUAL CAUSE/CONTRIBUTE TO THIS ACCIDENT? 41. If drug use by this individual caused/contributed to this accident, check appropriate block. 44. WAS ACTIVITY/TASK PERFORMED IAW STANDARD/REFERENCE? 45. DID INDIVIDUAL MAKE A MISTAKE? 51. WHICH ITEM FROM SECTION C APPLIES TO THE INDIVIDUAL NAMED IN BLOCK 12? 55. Dollar cost of damage. 56. Rollover protection system installed? 57. Was this item being towed? 58. If towed, enter letter for item doing towing. present this information in accordance with DA PAM 385-40, paragraph 4-4. Section A - Accident Information - contains 11 Blocks in total. The type of report is identified in Block 1. Blocks 2 through 9 require the identification code of the unit associated with the accident, the unit name, military address, unit branch, the date and the time of the accident. Block 10 should be completed if any explosives or ammunition were involved in the accident. Blocks 11a through 11c require the exact location of the accident along with the type and the coordinates of the location. Section B - Personnel Information - is for providing information about injured staff. Blocks 12 through 18 should contain the personal data about the injured individual. This includes their name, social security number, date of birth, gender, rank or grade, military occupational specialty or job series, and address. The form requires an official address for military and government personnel and a home address for injured civilians. Block 19a requires the duty status of the individual at the time of the accident. Flight status is indicated in Block 20. Block 21 and 22 describe the amount of sleep the individual has had on the day of the accident. Blocks 22 through 30 are filled out if the individual has sustained injuries as a result of the accident. The type of action the individual was performing at the time of the accident is specified in Block 31. A detailed description of the action is given in Block 32. Block 33 requires specifying whether the action was performed during a field exercise or operation. Block 34 is completed if the action was a part of an activity or tactical training. Block 35 is for pro identifying the type of training facility used. Blocks 36 through 39 describe the individual's training and licensing. Block 40, 41 and 42 are completed if alcohol, drugs or vision enhancement devices contributed to the accident. Blocks 43 through 51 summarize all other details regarding performance standards, the individual's driving mileage, license checks, and the employment and deployment information. Section D - Environmental Conditions Involved - is for specifying the environmental conditions that have caused or contributed to the accident. Section F - Corrective Action and Command Review - is for the findings and recommendations of the investigation board. Section G - Safety Office Use Only - is filled out the authorized personnel at Army Headquarters. Section H - Explosives/Ammunition - is for providing explosive or ammunition information. DA Form 285-A, Technical Report of U.S. Army Ground Accident Index A is a form used for reporting Class A ground accidents that happen in the U.S. Army. DA Form 285-AB, U.S. Army Abbreviated Ground Accident Report (AGAR) is a report used for Class C to Class E ground accidents. DA Form 285-O, Technical Report of U.S. Army Ground Accident Statement of Reviewing Officials is a form filled out by the officials authorized to record and review the details of the accident. 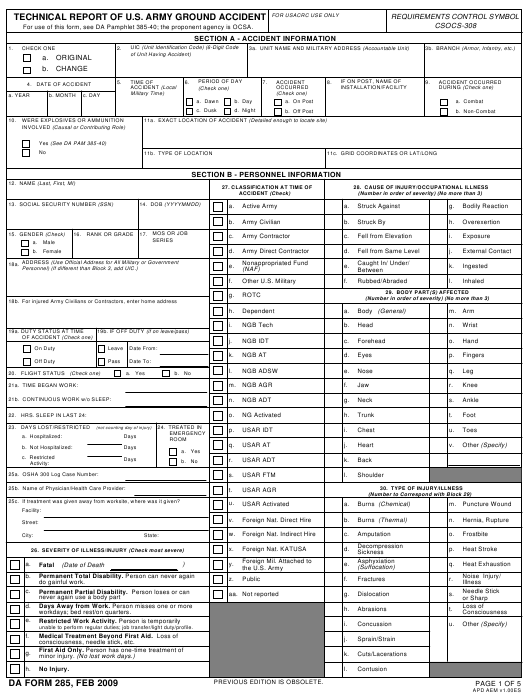 DA Form 285-W, Technical Report of U.S. Army Ground Accident Summary of Witness Interview is a form used to record interviews with the witnesses of accidents.